More than 110 Belleville sons died in World War II. Eugene Adams was killed in action in the Pacific prior to April 28, 1945. Lt. Ernest Alden was declared KIA in Europe on November 1945. Peter Andrusyn was killed in the South Pacific on Feb. 26, 1945. Walter Joseph Antonik was KIA over Europe on Jan. 3, 1945. Patrick Barbone was killed over Europe on June 2, 1944. Giavanni Bocchino was killed in the South Pacific on Oct. 25, 1944. Alvin C. Brown was killed in Italy on April 6, 1945. Victor R. Bruegman was killed over Hungary on July 2, 1944. Morris C. Catalano was KIA at Anzio, Italy, on May 14, 1944. Joseph John Cifrodella was lost at sea on Nov. 4, 1944. Clatie Cunningham Jr. was killed in the South Pacific on July 23, 1945. Joseph Curran was declared KIA over Europe on March 1, 1946. John J. Daly Jr. was KIA in Normandy on July 4, 1944. 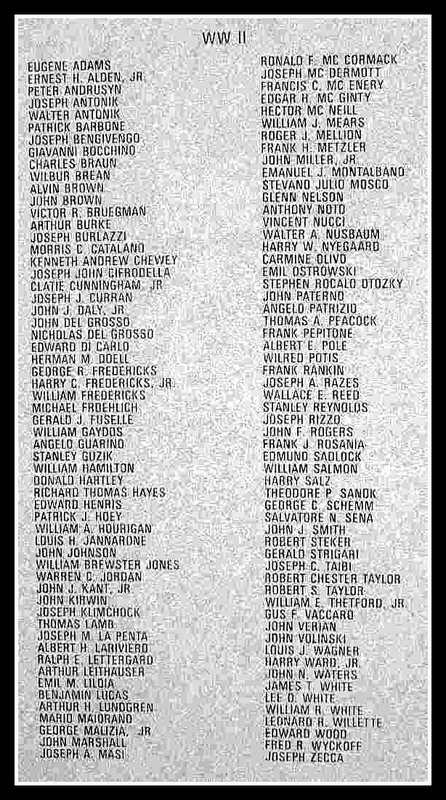 Edward DiCarlo was KIA on Guam on June 26, 1945. John Del Grosso died in San Diego, Calif. on Nov. 8, 1943. Nicholas Del Grosso, 19, KIA in Italy on Feb. 20, 1944. John A. Distasio, 19, KIA in the South Pacific on June 22, 1945. Herman M. Doell was KIA in Europe on June 6, 1944. George R. Fredericks was killed in service during WWII. Harry C. Fredericks was KIA in the Gulf of Mexico on May 19, 1942. Lt. William Fredericks was declared KIA on May 5, 1945. Michael G. Froehlich was killed over Europe on June 11, 1943. Gerald Fuselle died in North Africa on July 10, 1943. Angelo Guarino was KIA in France on July 18, 1944. Stanley Guzik was KIA in the Philippines. Donald Hartley was killed in the North Atlantic on Aug. 18, 1943. William Hourigan was KIA in the Philippines about Nov. 5, 1944. Louis H. Jannarone died in Washington, D.C., on Oct. 31, 1944. Corp. Warren Jordan was killed in the Pacific March 7, 1945. John J. Kant Jr. was reported missing in action July 30, 1942. Joseph Klimchock was killed in Italy on Dec. 2, 1943. 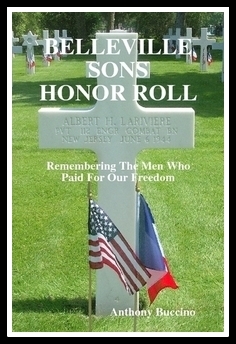 Albert H. Lariviere was KIA at Normandy on June 6, 1944. Arthur Leithauser was KIA in France on Nov. 2, 1944. Emil M. Liloia was KIA on Iwo Jima on March 1, 1945. Benjamin Lucas was killed in China on Sept. 28, 1945. Arthur H. Lundgren died at Fort Dix, N.J., in September 1941. Mario (Morano) Maiorano was killed in Tunisia in May 1943. George Malizia Jr. was killed in Germany on April 7, 1945. Gus M. Marshall Jr. was killed in Italy on July 8, 1945. Joseph A. Masi was KIA in France on Oct. 25, 1944. Ronald F. Mc Cormack was MIA in Normandy, June 9, 1944 . Sgt. Joseph Mc Dermott was killed in Europe in 1944. Francis C. Mc Enery was killed over Belgium on Jan. 4, 1944. Corp. Hector Mc Neill was killed at Anzio, Italy, on June 1, 1944. 2nd Lt. Roger J. Mellion was killed in a plane crash Jan. 13, 1945. Frank H. Metzler was presumed dead over Germany on Sept. 10, 1945. John J. Miller, Jr. was KIA on Saipan in 1944. Emanual J. Montalbano was KIA. Steveno J. Mosco was KIA in Normandy July 27, 1944. Glenn Nelson, 21, missing in a hurricane Sept. 12, 1944. 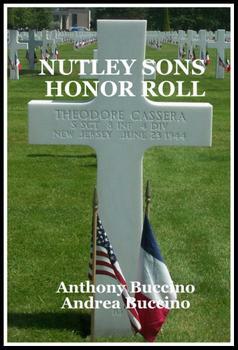 Vincent F. Nucci was KIA Oct. 21, 1943. Walter A. Nusbaum was killed in Germany on April 25, 1945. Stephen R. Otozky was killed at sea on Feb. 2, 1943. 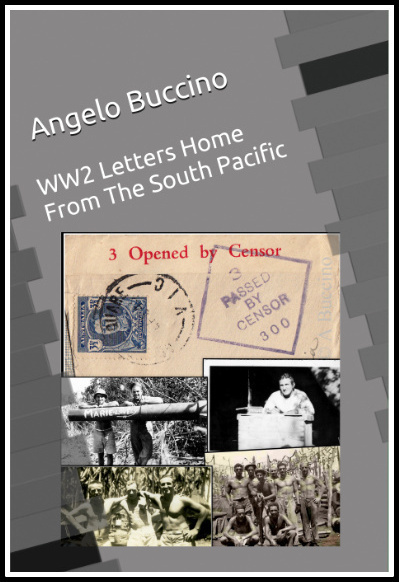 Angelo Patrizio was killed in Europe on May 16, 1945. Thomas Peacock was killed at sea on Sept. 11, 1943. Albert E. Pole was killed in Guam. Frank Rankin was killed over France on March 6, 1945. Joseph Razes died in the South Pacific on June 2, 1944. Stanley Reynolds died in Nutley while home on leave May 3, 1942. John Rogers was MIA before February 1944. Frank J. Rosania was KIA in Brest, France on Aug. 26, 1944. 2nd Lt. Edmund Sadlock was KIA in the South Pacific Feb. 19, 1945. Theodore Sanok was killed in an accident at Ft. Blanding, Fla.
Salvatore Sena was KIA in Anzio, Italy on April 8, 1944. Lt. John J. Smith was killed over England Jan. 5, 1945. Robert Stecker was KIA in France on August 15, 1944. Gerald Strigari died in the Brooklyn Naval Hospital on Aug. 10, 1944. Joseph C. Taibi was killed in Tunisia in April 1943. Sgt. Louis Wagner died following an accident in Georgia, on Oct. 2, 1942. Harry Ward Jr. was MIA in the Philippines on Dec. 12, 1944. John Waters died Feb. 13, 1946, from injuries sustained in the Pacific. William White was KIA off Salerno, Italy, Sept. 11, 1943. Leonard Willette was MIA over Germany Sept. 22, 1945. Fred R. Wyckoff was KIA in Tunisia on August 1943. The population of Belleville, N.J., in 1940 was 28,167.
of the 405,399 Americans that lost their lives during World War II, there were 78,976 Missing In Action. 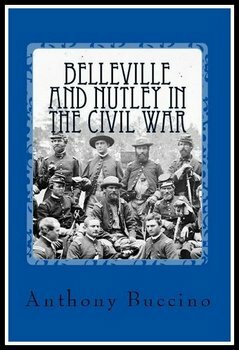 In June 2016, Belleville Township Council this month passed a resolution to dedicate certain streets in town to servicemen who hailed from the municipality. As we add these signs, we are trying to contact relatives of the soldiers to be present at the ceremony. If you are family or know of family of these fallen soldiers, please contact us.